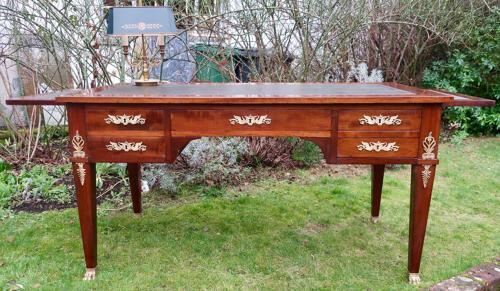 A wonderful French second Empire writing table or bureau plat, in figured mahogany. With four drawers and leather covered slides to each side. Very nice quality ormolu appliqués to the front back and sides. All finished to the back so can be used away from a wall. Excellent condition and colour, with original leather writing surface..